Sakura season is almost at a close, already. It always seems fast, but this year particularly so–it felt like the blossoms were barely on the trees before the wind and rain (and maybe a few aftershocks?) shook them all to the ground. Ah, well. There will be plenty of other flowers, and Sakura season will come around again next year. This is possibly my favorite photo of the season, taken at what is now known around our house as Youhei Park. I haven’t seen Youhei since that day, though the park is often full of kids, and even a few of my students. It’s a pretty great place, and we’re pretty happy to be in Japan these days. It’s not bad for an iPhone shot, eh? My favorite part is the shadows on the petals. What do you think? As always, you can click to enlarge! Also, this is my entry on this week’s Show Me Japan, hosted by Ichigoichielove. Go check out all the great entries! This entry was posted in Photos! 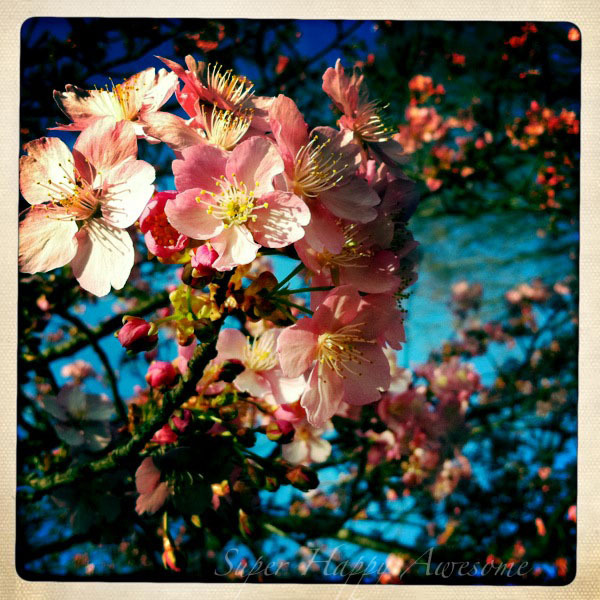 and tagged Cherry Blossoms, flowers, hipstamatic, iphone, photo, pink, pretty, Sakura, Youhei Park. Bookmark the permalink. I wasn’t even checking the scheduled time, but it did seem a bit later than usual. Then again we’re a bit farther north, so I assumed it was that. Still, tt went so fast! Waa, utsukushii ne! Sakura ga DAISUKI da yo! I’m so sad that they’re all mostly gone now 😦 My poor mom was hoping that a few would hang around for her trip here in two weeks… guess it wasn’t meant to be. Aw, bummer! Yeah, my dad would have been here for perfect cherry blossom time, but canceled his trip after all the crazy stuff. Maybe your mum can catch some late blooming trees! How long will she be over for? Impressive photo! Did you enhance it at all? I just got an iPod Touch and will be pretty happy if it can take pictures like that. Thanks! The filter is from the Hipstamatic app, which is my favorite iPhone app. There’s some good photo apps, but this is, for me, the best. It can be a bit tricky, and not every picture turns out well, but I’m a big fan. You can definitely use it with the iPod touch, though I’m not sure if the camera is the same as on the iPhone 4? Yeah, think the latest Touch and Phone have the same hardware. I’ll check out that app, thanks! Lovelovelove the picture 🙂 We didn’t manage to get out for hanami at the peak time (with a newborn nothing seems to go to plan) but did get out in the end… so sad it’s over for another year!